Our coupon solution is not only mobile friendly, but able to be shared to friends that are on desktop as well. 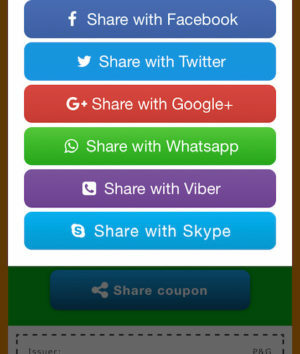 Sharing including email, sms or social media sites. Customers can save to email, a PDF image on device, Facebook account, print or mobile wallet for later use. This gives customers many options to use at later time. Stats include views, claims and validations if connect to point of sale system. We can also see location of claims/ validations as well from users who agree to use location. We can give customer an option of submitting their email or share on Facebook to gain access to special offer. Other options include watch a video, install app or make a payment. We have the ability to place a re-targeting pixel for anyone that has shown interest in the offer to remind them at a later time. An expiration date and count down clock can be added to control time of redemption and add a sense of urgency for offers. Multiple locations can be used with Google maps embedded on coupon for directions to nearest locations that are accepting the offer. Integration is available for POS systems to give a scanning solution. A few options for validations and barcode integrations including QR code, Aztec, Manual keying and more. Bring customers in by seeing your coupon on email, SMS, social media, QR codes, NFC, Wifi or our mobile display ad solution using geofences. 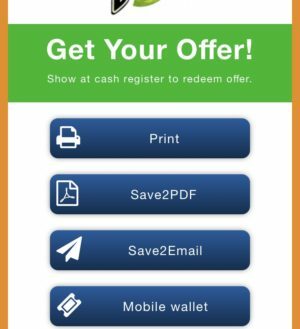 Our mobile coupon solution gives the marketing features needed for a great mobile friendly user experience in the 21st century. Our goal is to provide more relevant mobile marketing and advertising for both the marketer and mobile user. Consumers love coupons and mobile ads relevant to them, So an entire relevant ad solution is what we strive for. By combining relevance targeting using location (geofencing), interest and time with mobile advertising it adds relevance to ads that consumers see on their smartphones. This is what consumers want, offers that make sense to them in their own mirco moment. In fact, a recent Forbes article put it best by saying “Gives Consumers The Ads They Want” The article explains time and interest ads relevance for ads. Customizing advertising content based on the audience is a plus. Actually “88% believe custom content is a way for new brands to reach out to them” Adweek. 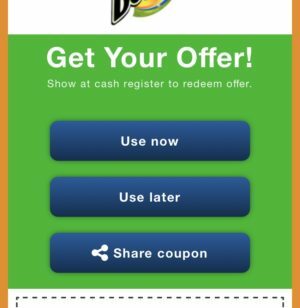 With our user friendly and consumer friendly mobile coupon landing page solutions consumers can share and better yet save the mobile coupon for a better time when closer to buying situation. Too many times mobile coupons require printing or immediate use and that just is not logical. The solution we can provide our clients includes the ability for their customer to save via emailing to them selves, save to Facebook, save to phone image/file and to customer wallet and more. If the mobile users like what the see in offer for someone else they can share multiple ways include via social media or email as well. Thumbvista can help in the entire mobile marketing journey. By leveraging location and geofencing to contextual targeting to after click coupons and user friendly landing page experiences we can help a marketers through out so it is a win win for both the marketer and the consumer that has the ad in front of them.